Boardmasters Festival is an annual, four-day event held in August. 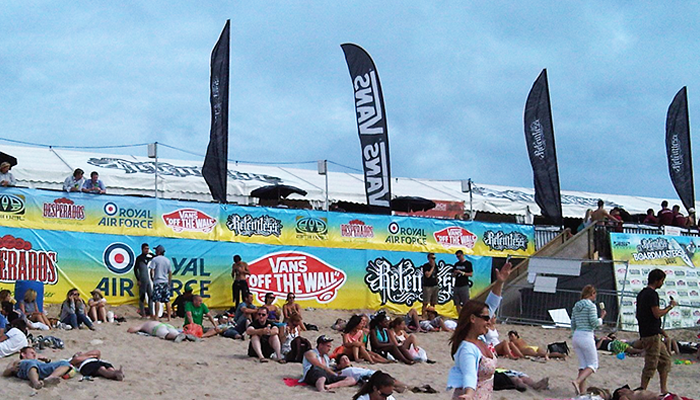 With sites split over Cornwall’s Watergate Bay, Newquay and Fistral Beach, the festival includes live music, BMX, skateboarding and surfing competitions. EHP were commissioned to construct a dancefloor terrace on Fistral Beach as part of the event. To erect a branded terrace, running from the beach carpark onto the sand. The platform must be able to withstand up to 300 people dancing on top of it. The terrace should also accommodate a 2.5m drop from the carpark to the beach. The main challenge facing us on this particular project was building on sand – a difficult surface to work with due to the likelihood of sinkage. To avoid this problem, we utilised Staging Concepts 9600 telescopic leg frames, supported by square sole boards, which enabled us to build quickly. Once the framing system was in position, all 120 stage decks were simply dropped into place and locked together. Attaching the handrails and taping up any roto lock holes caused by the sand formed the finishing touches. The build took just a day with a team of eight, ready for the branding to be applied the following morning. 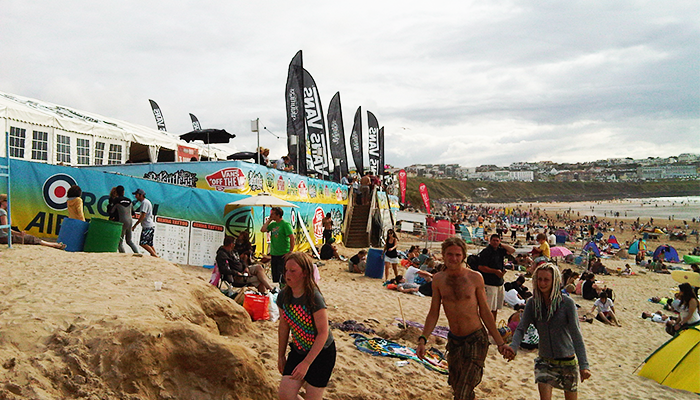 The result was a fantastic event space overlooking Fistral Beach – perfect viewing for the surfboard championship events!